COMPOUND SINE PLATES by Suburban Tool, Inc.
Made of steel, hardened to Rc 58-60. Sizes up to 6" x 6" have 1/4-20 tapped holes. Larger sizes have 3/8-16 tapped holes. 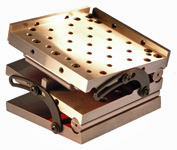 Part of the SineSet® System. Other products with the same part # suffix will bolt directly to these compound sine plates (for compatibility chart click here). 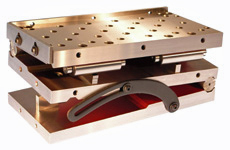 Each gage block roll has two 0.200" minute steps for setting small angles with standard gage block sets. Two locking straps that always remains below the top surface and two hardened & ground rails are standard.